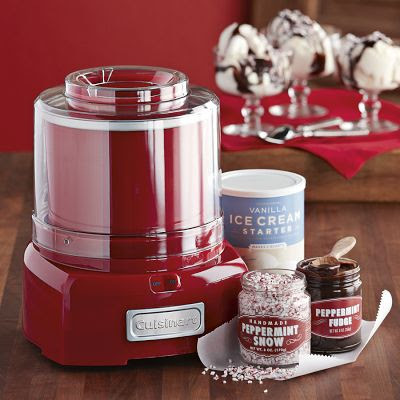 This weekend Steak and I purchased a Cuisinart ice cream maker at Clarendon's Williams-Sonoma. We've already made a batch of vanilla ice cream with fresh pomegranate as topping. In all my years and all my ice cream sampling, I can say confidently that this was the best ice cream I've ever tasted. And we used the ice cream starter package instead of fresh ingredients, so I cannot even imagine how good that will taste. Hope you had a very happy weekend! welcome to our humble little blog. please join us as we eat, laugh and love. and please contact us at legs@steakandlegs.com or steak@steakandlegs.com. Steak & Legs in their natural habitat. The ups and downs of cookie crafting. Tech Tuesday: I Want That! Happy December to Me and You! Steak and Legs Blog by Steak and Legs is licensed under a Creative Commons Attribution-NonCommercial-ShareAlike 3.0 Unported License.